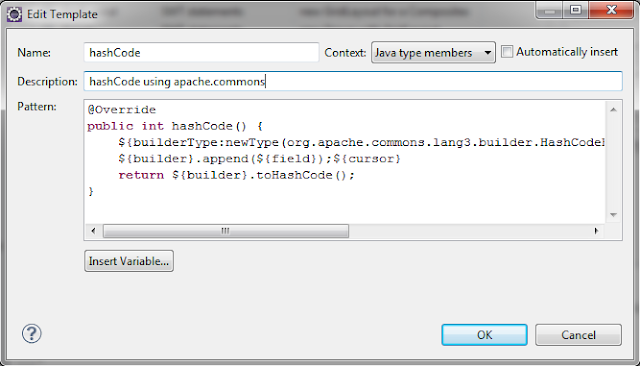 Apache Commons project represents a set of reusable Java components. Apache Commons Lang is one of the Apache Commons components. It provides much needed additions to the standard JDK's java.lang package. One of its packages, org.apache.commons.lang3.builder contains a set of very useful builders that helps in creating consistent equals(), hashCode(), toString() and compareTo() methods. 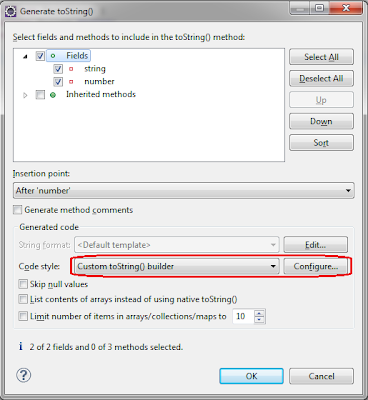 In this post, I will show how to generate equals(), hashCode(), toString() and compareTo() methods using Apache Commons Lang builders in Eclipse. For demonstrations I will use the latest stable release - Apache Commons Lang 3.0. Note that Lang 3.0 uses a different package (org.apache.commons.lang3) than its predecessors (org.apache.commons.lang). All the examples presented in this post will work also with the previous Apache Commons Lang releases; just change the package name from lang3 to lang. Eclipse supports out of the box generation of equals(), hashCode() and toString() methods. But only the generation of toString() can be configured to use different builders. 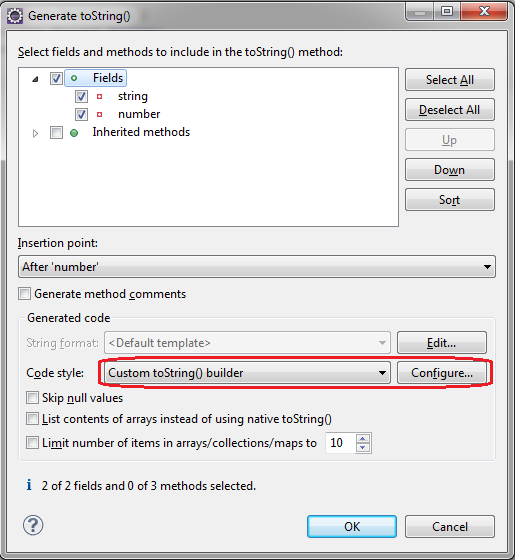 Below is shown how to configure Eclipse to use ToStringBuilder to generate toString() methods. Prerequisites: Eclipse project is configured to include Apache Commons Lang jar in classpath. We have a class with 2 fields named string and number. Open Generate toString() wizard (from menu select Source -> Generate toString()…). 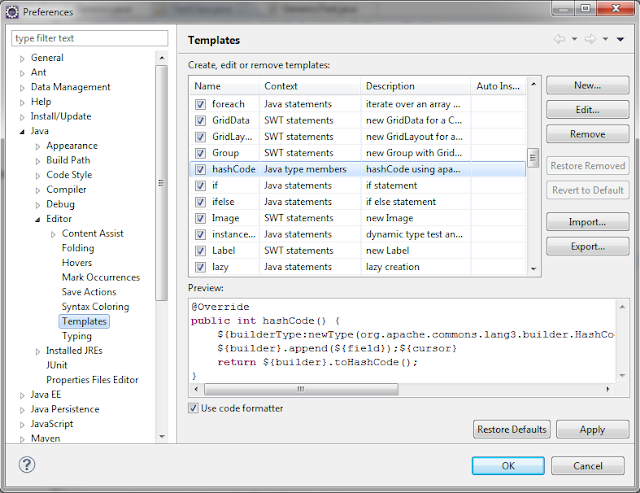 Choose Custom toString() builder option from Code Style drop down and press Configure… button as it is shown below. Using Browse… button select org.apache.commons.lang3.builder.ToStringBuilder as Builder Class and press OK.
Eclipse will save your settings, so next time you will not have to repeat these steps again. Just open Generate toString() wizard and hit OK.
As I mentioned earlier, only toString() generation can be customized in Eclipse. Still, we can configure Eclipse to generate equals(), hashCode() and compareTo() using Apache Commons Lang builders by using Eclipse templates. Templates are little pieces of code with defined placeholders. Each template has a name, which serves as a shortcut to the template itself. You type the name, press CTRL + SPACE and it will be expanded. 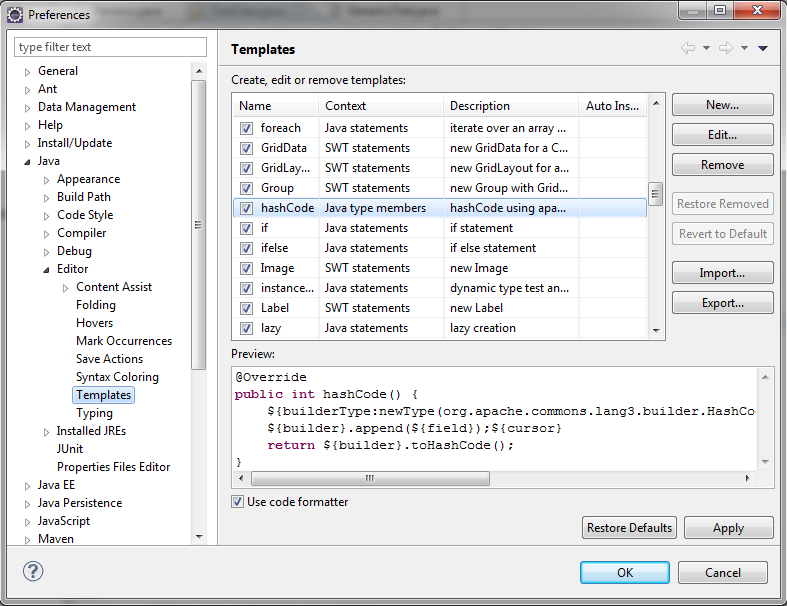 In order to access Eclipse templates open Window -> Preferences and select Java -> Editor -> Templates. Now you can create new templates, edit existing ones or import directly ready templates. Following is a list of templates that will allow you to generate equals(), hashCode(), compareTo() and even toString() using Apache Commons Lang builders. Also you can easily import all the above templates using Import… button from the following file eclipse-templates-apache-commons.xml. After you defined the templates, you can start using them through Content Assist (CTRL + SPACE). Start typing the name of template in editor and then press CTRL + SPACE. Choose the required template and press ENTER. These images helped me to put codes at right place. Thanks for posting them. Help! I followed your pattern, but the field is not automatically populated, why?